Neck fat is the accumulation of excess fat around the neck, resulting in a double chin and some fatty bands on your neck. Also known as sub mental fat, it not only makes you look ugly but also interferes with free body movements. Neck fat is downright troublesome in hot weather. What causes us to have neck fat? There are a lot of reasons a person may get neck fat. Obesity is the most common reason. The other major reason is age, as with age, people lose their skin elasticity. This leads to an uneven distribution of fat, causing the skin to sag. With age, the muscles also start giving out. Then some people may get neck fat because of their genes. Often, neck problems, which may result in fat lumps in the region, are hereditary. Women have been found to be more prone to neck fat owing to their soft skin. Hypothyroidism, another reason attributed to neck fat, may or may not be hereditary. 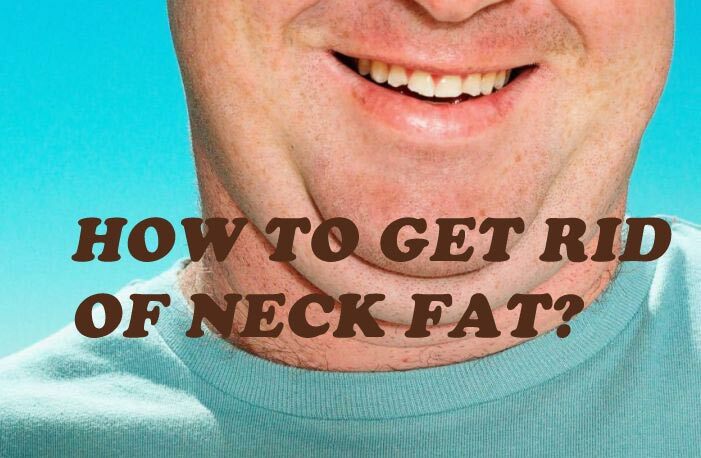 This is one of the easiest ways to lose neck fat quickly. • Pout by sticking out the lower lip. Place a finger on your wrinkled chin. • Remain in this position for a few seconds. • Still pouting and without leaning your upper back, push your chin down for it to touch your chest. • Remain like this for a few seconds before returning to the original position. Do this around 20 times in a set, and do 2 sets daily. This is an unconventional yet effective way of reducing neck and chin fat. Take a tennis ball and place it on your neck, below your chin. Holding it in place tightly with your chin, press the ball down with your chin to the maximum possible extent. Keep on doing that for at least 10 seconds. Repeat this 10-15 times at a stretch. And repeat the whole process 4-5 times a day. This is a very simple exercise which you can perform anywhere on the go, while both standing up and sitting down, and even in your office while working on your desk. Cocoa butter has emollient properties which helps in exfoliating dead skin cells and eliminating sagging skin. Because cocoa butter is anti-oxidant it goes a long way in making your skin radiant. Cocoa butter increases skin elasticity and thus reduces the neck flab. Take the given amount of cocoa butter and microwave it for 30 seconds to turn it into a liquid. It will look like oil. Now soak the cotton balls for a minute in that. Then apply the oil to your neck area using those cotton balls. Spread the oil out evenly and gently massage your neck using your fingertips for 5 minutes before wiping off the oil using a warm and wet cloth. To get the best results, use this remedy twice daily- before a bath and before going to bed. Bad eating habits and bad teeth health often makes us forget the importance of chewing well. Along with helping in digestion, chewing also helps in getting a slim neck by keeping your chin muscles toned and preventing extra fat from getting deposited under your chin. Use at least 4 to 5 chewing gums a day to reduce the extra fat on your chin and neck. Using sugar-free chewing gum is also a good way of preventing gum disease. Melon has high water content along with a lot of vitamins and minerals. Its anti-inflammatory properties help in reducing sagginess of the skin. As it is a natural skin toner, it helps in tightening the skin and improving the elasticity. Extract the juice in a bowl. Now soak the balls of cotton in it for about a minute. 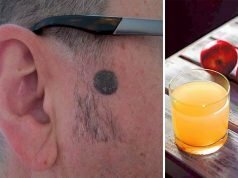 Apply this juice on the areas of your neck where the fat is accumulated. This is done using those balls and leave it on for 10-15 minutes. Wash the juice off with cold water. To lose considerable neck fat in one week, use this once daily. Eating melon regularly is also a good way of reducing weight overall. Egg white is a natural anti-ageing agent. 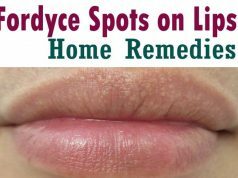 It works by removing dead skin cells and by tightening the skin. Make sure to separate the egg whites from the yellow yolk before you proceed. Now add the milk and honey to the egg white and mash them properly to create a homogenous mixture. Add a tablespoon of lemon juice to this paste. Dip your fingertips on the paste and gently massage your neck with a little of it. Once it is complete, apply the paste as a mask. Leave it on for 25-30 minutes before rinsing it off with warm water. Use this twice weekly to cut down necklines. Wheat germ oil contains a lot of vitamins and minerals like Vitamins E and B6, magnesium and potassium. These are very beneficial for the skin and help in reducing sagging by tightening it. To use wheat germ oil to get rid of chin fat, massage your chin and neck with it twice daily for 5 minutes each time. The best times to massage are before having a bath in the morning, and before going to bed. Milk has long been used to treat skin issues. It reduces free radicals and thus acts as a natural anti-ageing agent by tightening the skin. Also, the lactic acid and minerals present in milk are very good at reducing fat. Massaging with milk helps in fast getting rid of the dead skin cells. Add 2 tablespoons honey to half cup of milk. Mix them to create a smooth paste. Now using your fingertips, massage your neck with that paste. Leave it on for about 15 minutes before rinsing with slightly warm water. Then, apply this daily till there are visible results. Glycerin protects the skin from stress and prevents dehydration. This is why glycerin has long been an important ingredient in a wide range of beauty products. Glycerin mask and massage is used to make the skin flexible and to get rid of the neck fat. Add half a tablespoon of Epsom salt with some drops of peppermint oil to a tablespoon of glycerin. Using a cotton pad, apply the mixture on the neck area and leave it on for 10 minutes. Wash it off with cold water. Apply this 3-4 times a week to get the best results. This is an effective exercise against neck fat. However, you need to talk to your doctor before starting with this, because many people with neck joint issues have had trouble with this. • Sitting straight on the floor, keep your hand down and away from the hips. • Slowly raising your other hand up, take it around your head to the other side so that it wraps around the top of your head. • Press your head down towards your shoulder by the pressure from your biceps. • Gently taking off the other hand from the floor, hold the upper arm. Remain in this position for 10 seconds before repeating it on the other side. Perform this for 10 times at least. • Drink a lot of water. Water keeps the skin hydrated and prevents sagging. Water also helps in getting rid of body toxins and lowering appetite. Drinking juices is a good way to keep yourself hydrated. However, remember that unsweetened, unprocessed juices are infinitely better than the sugary ones. • Reduce your caffeine and alcohol intake. This includes staying away from tea, coffee, soft drinks, etc. Such drinks can dehydrate your body like anything and mess with your energy levels. • Make it a point to work out regularly. • Avoid the extra calories in your diet and go for healthy carbs. Have whole grain carbohydrates which are rich in fiber. They keep you full for a long time, giving your body time to absorb all the required nutrients properly. Green, leafy vegetables also contain an adequate amount of fiber. • To maintain gut health and immunity, go for fiber-rich stuff. • Using a thin pillow while lying down or sleeping keeps the neck muscles busy. • It is essential that you maintain the right posture, always. Slouching weakens the neck and chin muscles, often leading to fat depositions around the neck. Keep your backbone straight and hold your head high. This would keep your neck, jaw and back muscles busy and thus help in getting rid of those fatty creases. It maybe rather difficult at first, but once you get used to it, you will barely notice it. • Maintain a balanced diet to lose weight. • Start performing the exercises lightly. Then increase the vigor and the numbers till you reach moderate levels. • Keep in mind that for healthy women the body fat should be between 14% and 24%,while for men it is between 6% and 17%. It is important to lose overall weight not only to avoid chin and neck fat but also to prevent many more issues. • Have a lot of lean proteins like fish and chicken. Avoid red meat like mutton and beef altogether. Lean meat has a better protein content that helps in muscle building. Also, make sure to go for fresh lean meat over the canned ones because the former comes with less sodium. Too much sodium in the body can make it retain water which further makes it difficult to get rid of all the fat. • Avoid eating food items with saturated fat like packaged and fast food, frozen dinners and desserts because the only thing that saturated fat does is add weight to your body. It provides no nutrition. • Running helps burn neck fat. As does yoga, which not only burns all sorts of fats but is a natural mental and physical detoxifier. Of course, there are a number of new and advanced techniques being developed to get rid of fat mechanically or surgically. But those can end up temporarily or permanently distorting the body if not done under expert supervision, and involves the usual pain and troubles associated with a surgery. Getting rid of neck fat at home through these natural remedies maybetime-consuming, but is not only perfectly safe and painless but also beneficial to the body. However, keep in mind that since neck fat can be due to some really serious reasons, you should always start your treatment by a visit to your physician. You maybe required performing a number of tests to determine all that goes into forming your neck fat. You should also consult a dietician to get the best diet and health plan in order to deal with the neck fat. Here’s wishing you the best in your fight with neck fat.